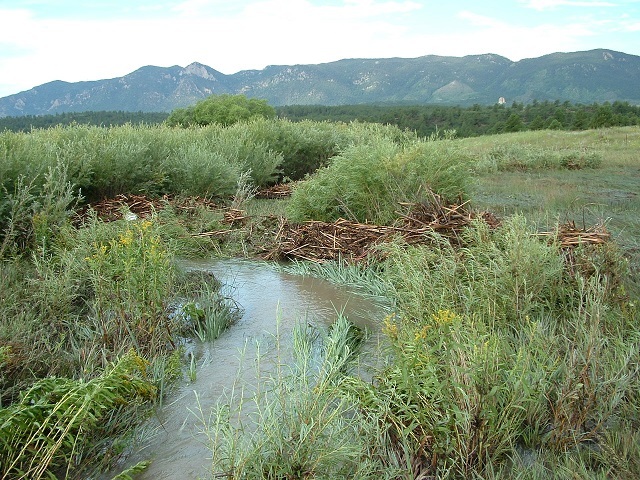 The Air Force Academy landscape plays a critical role in maintaining the resilency of the Monument Creek and Fountain Creek watersheds to regional flooding and urban stormwater drainage. 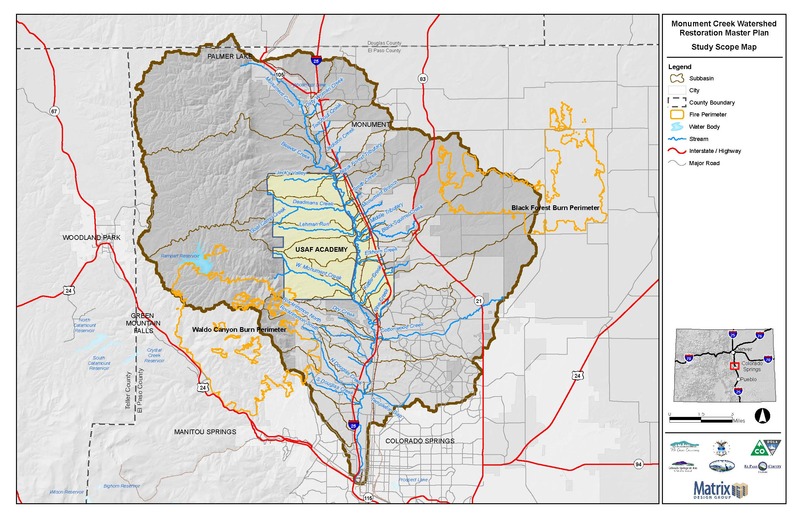 The installation's 18,455 acres, including Monument Creek and its tributary streams, cover less than 12% of the Monument Creek watershed, but the Academy's central location and lower elevation in the landscape results in nearly 75% of the drainage flowing through its streams. Fortunately, many of our wetland and riparian systems still provide irreplaceable ecosystem services such as diverse wildlife habitat, improved water quality, enhanced water and sediment storage, and flood protection. 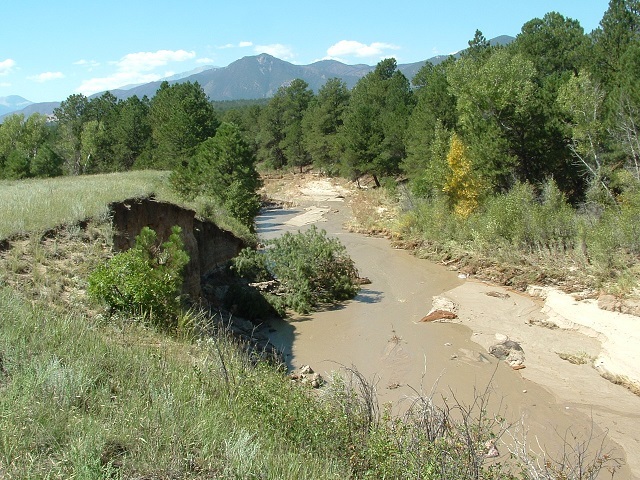 Many streams and riparian areas, however, have been severely damaged by improperly managed stormwater and poor water quality (primarily sediment) originating from off-base development. 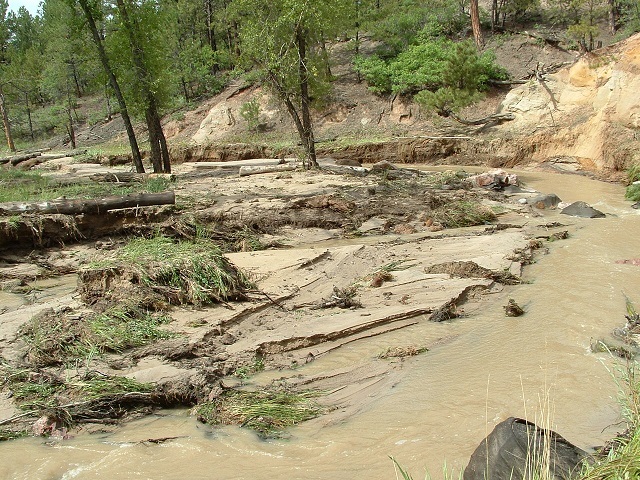 Runoff from impervious surfaces in the Cadet Area, Community Center, and housing has eroded other streams and drainages, also causing on-base habitat loss and sedimentation. 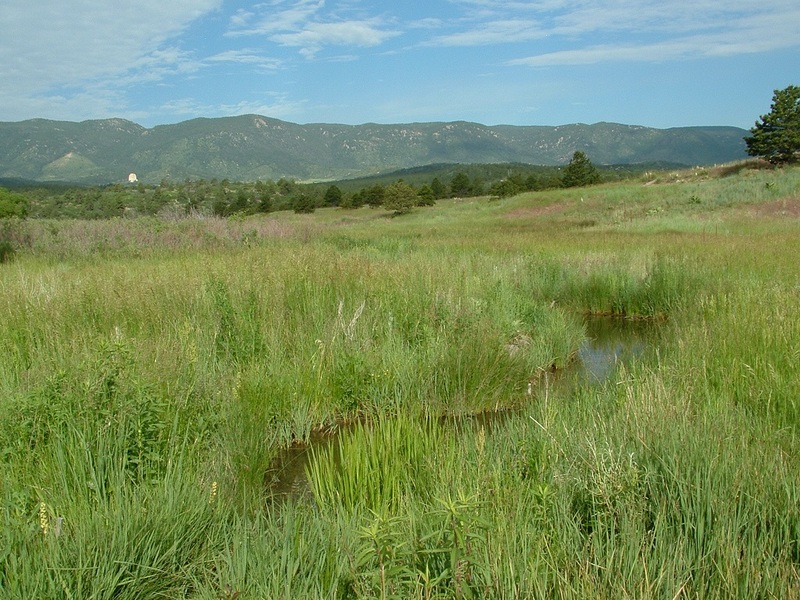 A healthy watershed, with proper functioning streams and riparian areas, provides valuable habitat for wildlife and enhances the scenic diversity and quality of the Air Force Academy's grounds. To help sustain these values, the Academy partners with various organizations, such as the Fountain Creek Watershed Flood Control and Greenway District (FCWFCGWD), to address regional drainage issues. 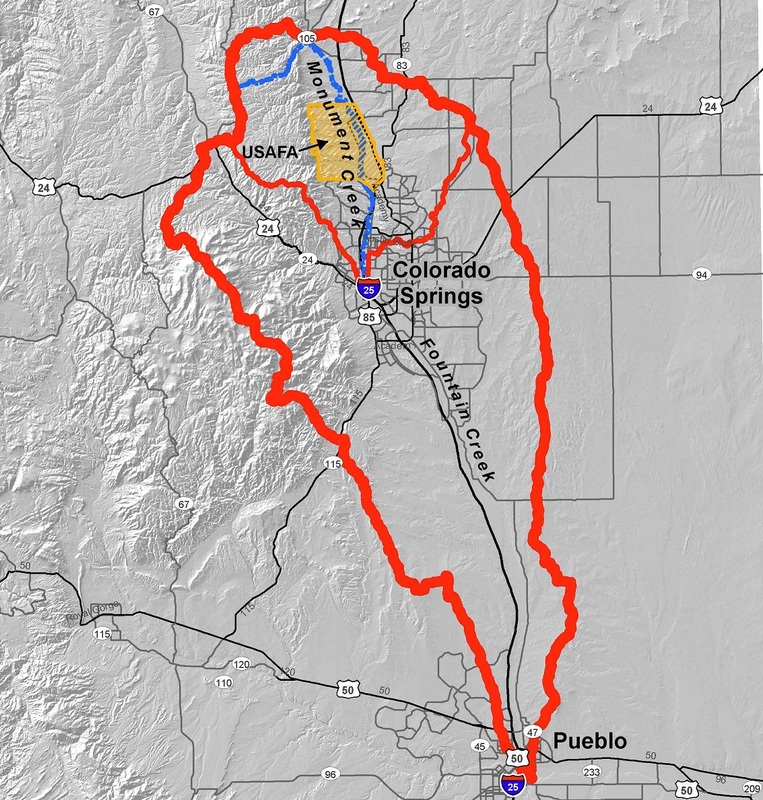 In 2016, the Academy partnered with the City of Colorado Springs, El Paso County, FCWFCGWD, and Colorado Springs Utilities to develop the Monument Creek Watershed Flood Restoration Master Plan. 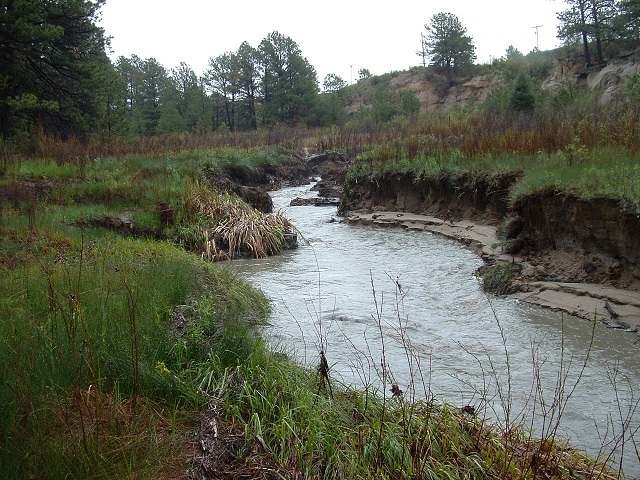 The plan identifies areas of hydrologic, hydraulic, and geomorphic instability within the watershed, and prioritizes recommended land management and engineering projects to address significant erosion and sedimentation problems. 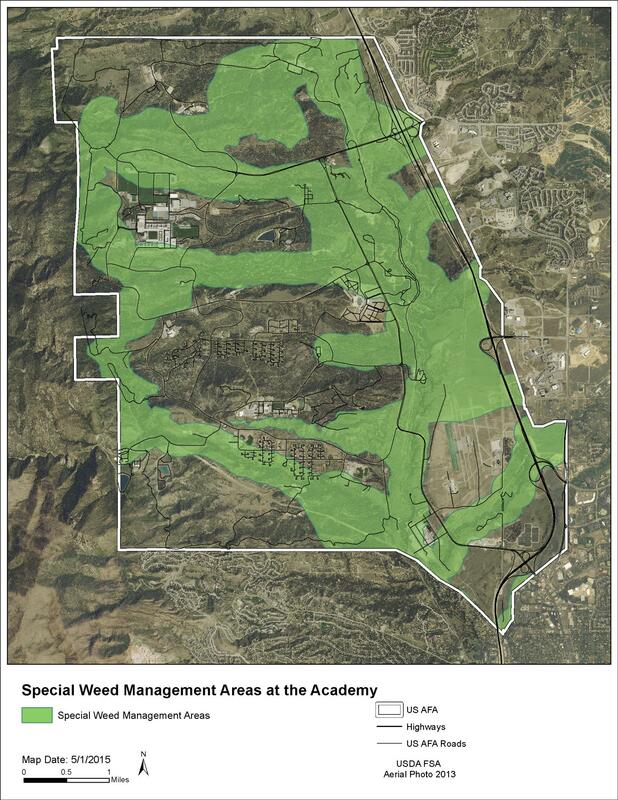 Many of the recommended actions will mitigate the off-base and on-base stormwater impacts that are degrading the Academy's wetland and riparian habitat, and could potentially threatenen the base's infrastructure. 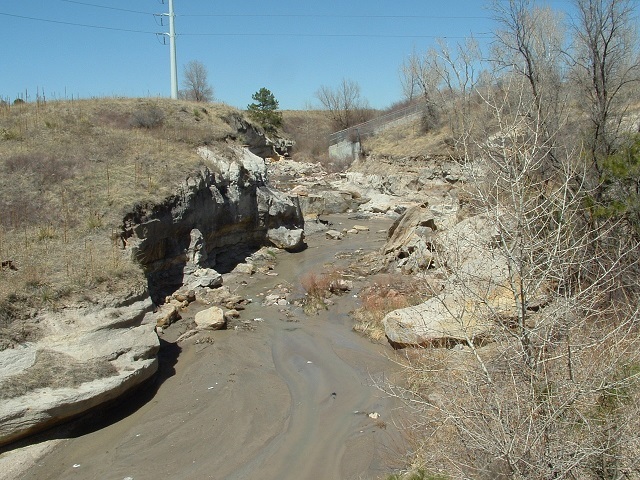 The base is currently working with the Colorado Department of Transportation, City of Colorado Springs, and Copper ridge Metro District to perform channel stabilization and habitat restoration projects on Smith Creek and Monument Branch within the Academy. 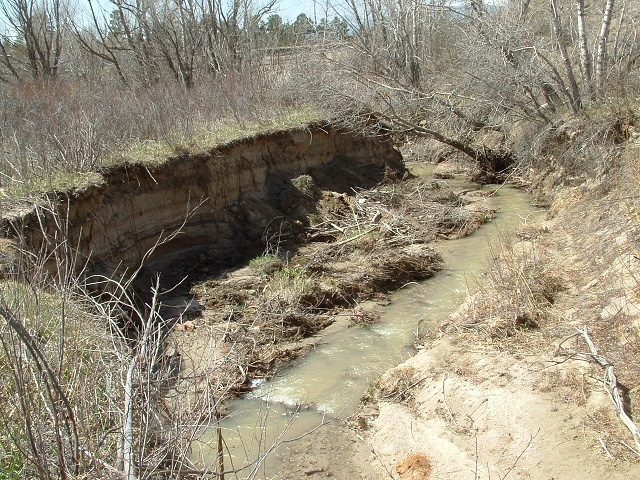 The Master Plan identified Monument Branch as one of the more significant sources of sediment within the watershed; on the order of 4,600 tons/year. 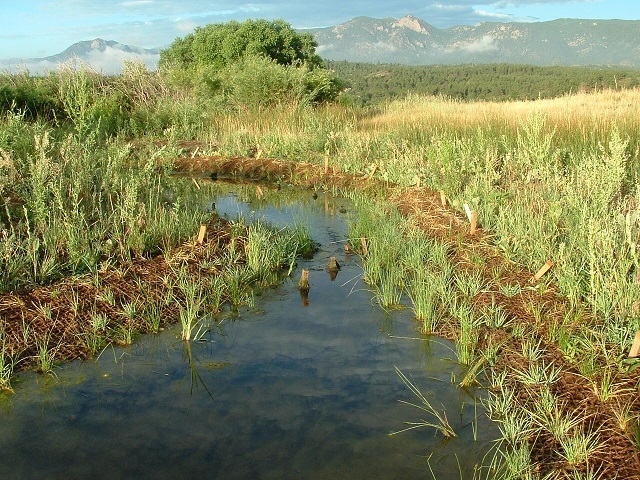 The Colorado Natural Heritage Program also prepared a Monument Creek Watershed Landscape Assessment in 2002. Noxious weeds are non-native plants that disrupt agricultural production and native ecosystems, causing economic loss and environmental damage. Many of these plants originated from Europe, Asia, or Africa, and were introduced to the United States without the natural organisms (often insects) that normally control a population. 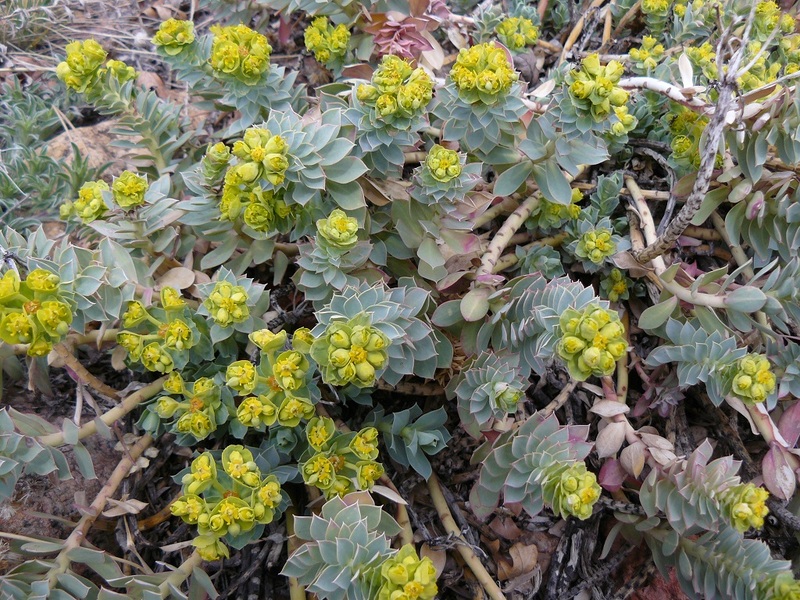 Plants introduced to the U.S. for the floral industry and landscaping have frequently escaped cultivation and become widespread weeds in native habitats. Introduced, non-native plants tend to thrive in natural and disturbed areas because they often grow rapidly, produce large quantities of seed, have extensive root systems, and may be unpalatable to grazing animals. Weeds can quickly overtake an area when seeds or pieces of root are dispersed by wind, water, animals, and people. Through annual monitoring and periodic surveys, Natural Resources evaluates the effectiveness of these measures for controlling noxious weeds. Monitoring and surveys also aid in the early detection and a rapid response to help prevent weeds from establishing and spreading. With over 20 weed species identified, including various thistles, knapweeds, spurges, and toadflax, management requires constant effort and vigilance. A complete list of weeds is provided in the Integrated Noxious Weed Management Plan. With so many weeds to control on 19,000+ acres, our efforts are prioritized by the ecological threat potential of weed species and their occurance in designated Special Weed Management Areas where important native plant communities, wildlife habitats, and rare species exist. Become a 'weed warrior' by learning to identify noxious weeds and taking appropriate control measures. The Colorado Weed Management Program website and mobile app is an excellent source of information on weeds, weed identification, and their control. 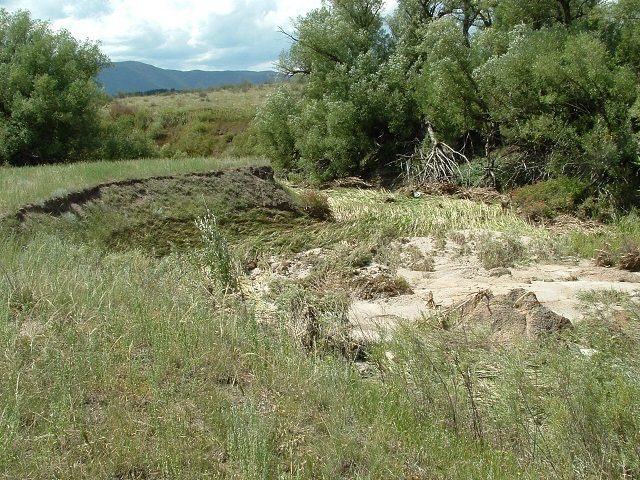 Land stripped of native vegetation by flooding, grazing, construction, fire, or other means is highly susceptible to noxious weed invasion and soil erosion. Wildlife habitat values, watershed hydrology, and landscape aesthetics are also affected by the temporary or permanent loss of vegetation. 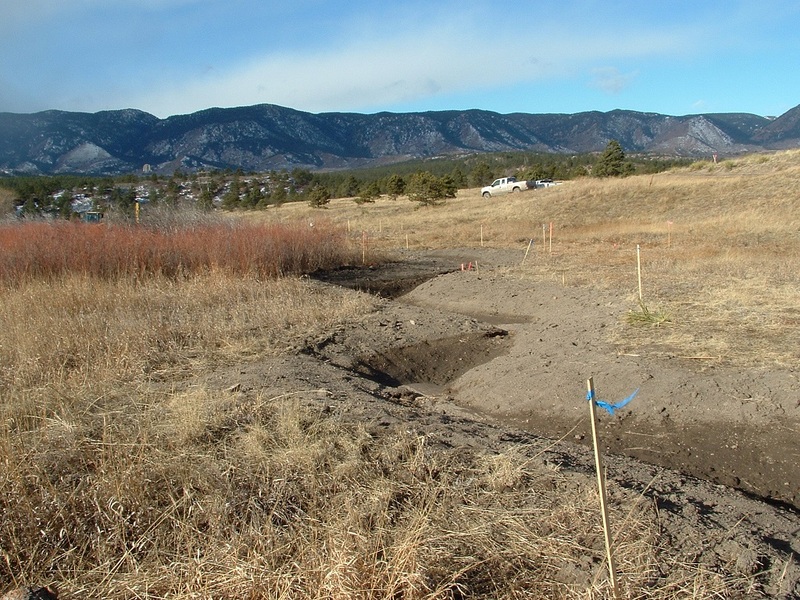 To mitigate these impacts and protect the Academy's significant natural and cultural resources, the base requires all land restoration activities utilize state-of-the-art revegetation and soil protection measures. 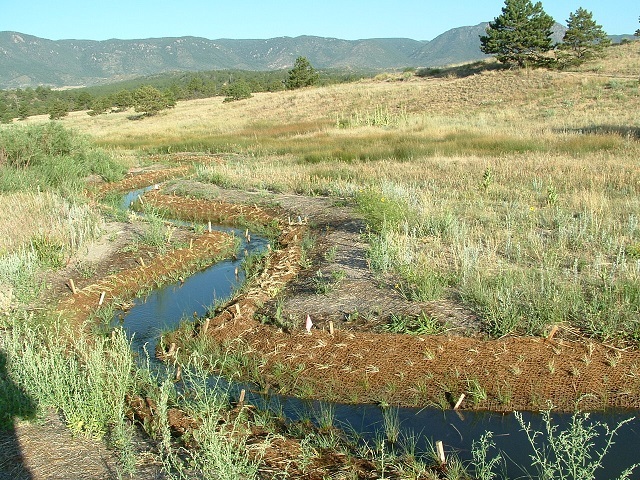 This is accomplished through Erosion Control, Revegetation, and Tree Care Standards which emphasize the use of native plants, quality topsoil, and biodegradable soil protection fabrics or mulches for restoration.